Your car's ‘skin’ of steel and glass is not only protective and beautiful, but it also attracts and stores a tremendous amount of solar (radiant) heat in the passenger compartment. Removing this trapped heat requires a very efficient system. 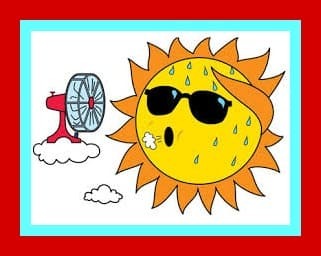 The Air Conditioning (A/C) system is a combination of mechanical components plus a chemical medium (Freon – not a psychic) whose sole purpose is to move heat from the interior to the exterior of the vehicle. Your car’s air conditioner uses Freon Refrigerant to cool the air internally. Freon acts a lot like water. As liquid Freon warms up it evaporates into a gaseous state (vapor), and then, as it cools down, becomes liquid again. As the Freon changes from a liquid to a vapor it heats and cools the air. What path does Freon take? When you dial the temperature in your car to Cold the Freon moves through the Receiver-Drier (see diagram) which collects moisture and dirt. 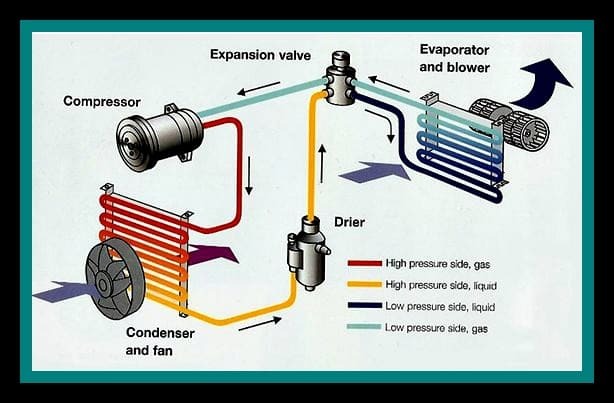 After the receiver drier, Freon turns into vapor inside the Evaporator where it chills and takes the heat out of the air. The evaporator is located inside the car. Then the vapor travels back to the A/C Compressor (in the engine area) where it gets compressed. Then the Freon flows to the condenser. Next the Condenser condenses the Freon back into a liquid state – creating heat under the hood, in the engine compartment. The condenser is located in front of the radiator. As the Freon completes its circuit by traveling back to the Evaporator to become vapor, it chills the air. As you notice in the visual aide, there is quite an infrastructure of hoses to carry Freon to the various A/C components: there is approximately 24 feet of very fancy hose with special crimpings and fittings. An air conditioner has super high pressures – up to 500 psi (‘pounds per square inch’). This is about 20 times the air pressure in your tires or 10 times the pressure of water as it comes out of your faucet. In order to perform properly, your car’s air-conditioner requires that all of the parts be functioning correctly. Working on A/C systems requires (by the B.A.R.) special equipment, training and certification. Water Star Motors, of course, has all of this and more! A note on Freon: Currently, all new cars have Freon type 134A. (environmentally friendly). Transition to environmentally friendly Freon began in the late 80’s. Older cars have the Freon R-12 (the O-zone Killer).